Gainesville’s unique combined culture of old and new offers something for everyone. The historic downtown area balanced by gorgeous outdoor spots gives it an air of romance. If you are looking to get away with your sweetheart, look no further than Sweetwater Branch Inn in the heart of Gainesville. Whether you are celebrating an anniversary or just looking for some alone time, there are plenty of romantic things to do in Gainesville, FL! 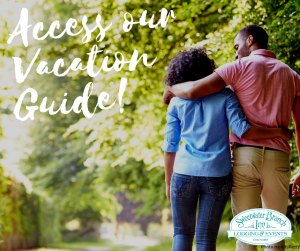 Take advantage of our complimentary Vacation Guide for even more ideas to include in your itinerary! Whether you take a leisurely walk through our lush gardens at Sweetwater Branch Inn or go on a hike, you can’t help but feel romance in the air under the Florida sun. Stroll hand-in-hand with your sweetheart as you explore incredible landscapes. Try somewhere like Devil’s Millhopper State Geological Site where a set of stairs will take you deep into a bowl-shaped crater with a mini rainforest at the bottom. Take in the gorgeous views of waterfalls cascading down the sides of the cavern and green vegetation surrounding the pool of water at the bottom. Did you know that Florida was actually the first place where people grew grapes in the U.S.? Of course, that means you need to do some romantic wine tasting while you’re here! As vinters attempted their winemaking in Florida, they realized the warm climate was not ideal for growing grapes and turned to other ingredients instead. During your wine tasting, you’ll find incredible fruit-based wines that use ingredients like blueberries, apples, blackberries, and more! Try somewhere like Island Grove Wine Company to get a taste of what Florida wine has to offer. Have a night out on the town with your sweetheart! Bars and breweries offer delicious drinks as well as live music on certain nights. Or, you can revisit your childhood when you go to the Arcade Bar, a 3-story building filled with everything from foosball to Pacman! Use the nightlife the city offers to spend some quality time with your sweetheart. Attending a Gainesville event or festival makes for the perfect date idea! Maybe the two of you would like to dress in Renaissance garb and attend the Hoggtowne Medieval Faire. Perhaps you’d prefer a ride on the Ferris wheel at the Alachua County Fair. Whatever affair fits your fancy, the two of you are in for a real treat! It’s no secret that the culinary scene in Gainesville aims to please. Nothing says “date night” like a candlelit dinner at a highly acclaimed establishment. Embers Wood Grill, Manuel’s Vintage Room, and Paramount Grill make excellent options for those looking for a romantic restaurant at which to make reservations. Additionally, Sweetwater Branch Inn offers a special romantic dinner package for guests to enjoy a three-course meal, with wine, prepared by a personal chef! If you and your partner consider yourselves to be creative types, then peruse works of art at galleries, museums, and festivals. Ponder the deeper meanings behind works at the Harn Museum of Art. Enjoy the weather at outdoor art festivals like the Downtown Gainesville Art Festival and the Santa Fe Spring Art Festival. Sometimes all you need for a romantic experience is fresh air, tasty treats, and each other. Sweetwater Branch Inn offers a special that includes a picnic basket for two! 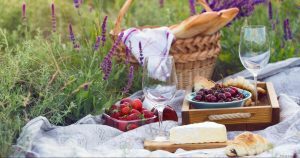 Share a light lunch before embarking on outdoor adventures or exploring attractions such as the Kanapaha Botanical Gardens. Florida Gator fans come far and wide for University of Florida football games at the Ben Hill Griffin Stadium! Partake in a number of exciting University of Florida traditions such as singing along to popular songs and snapping a picture of UF’s favorite couple, Albert and Alberta! Spend the day exploring downtown Gainesville with your significant other! Check out the Union Street farmers market, shop for books at Third House Books & Coffee, and grab a bite to eat at the Top! While you’re there, you might also like to browse exhibits at the Matheson History Museum! Sweetwater Branch Inn sits near tons of romantic things to do in Gainesville, FL. Just minutes from downtown, you are within reach of tons of activities you can indulge in with your other half. If you’re looking to relax, you can do that too! Our property has a saltwater pool, a putting green, and gorgeous gardens to walk through. Plus, we have the perfect accommodations for everyone. Choose from rooms and suites or even your own private cottage! You can also add one of our romance packages to make your stay extra special. It’s time to start planning!